In battle, mages need to stay mobile and moving, to avoid getting drawn into melee combat. 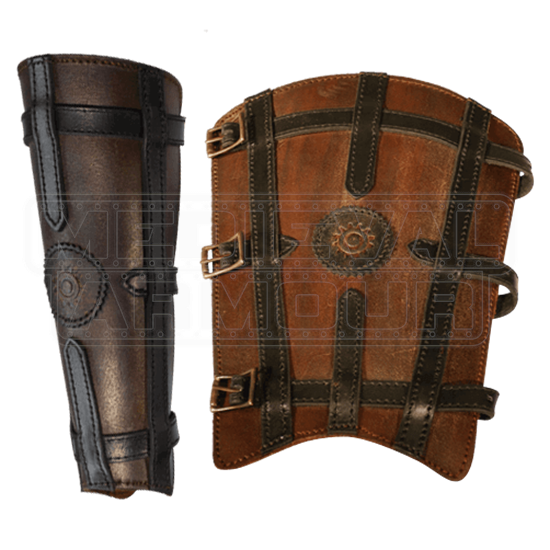 That is why when it comes to protection, sorcerers, spell-swords, and mages of all sorts prefer to wear something light, like these Sorcerer's Leather Greaves. They are crafted entirely in high quality brown leather and feature an ornate design that lets them stand out too. Leather straps crisscross over the greave, while the center features an engraved leather sun icon, to give it a more arcane and mystic look. The greaves are offered in two different sizes and secured with buckled leather straps, to ensure that each size is highly adjustable. 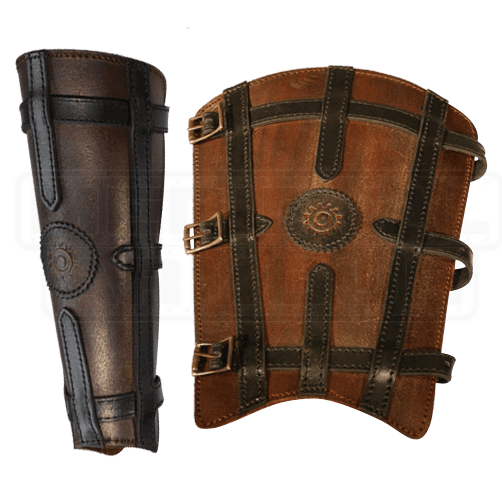 These Sorcerer's Leather Greaves are useful and protective additions that virtually any magic user or mystic should consider wearing when they head out to battle.